PM Narendra Modi’s upcoming visit to California and New York in the last week of September 2015 has already got Indian Americans into discussions about his arrival. On his second trip to the United States from September 23 to 28, the Prime Minister of India will meet Indian American entrepreneurs in San Francisco Bay Area, deliver a speech at Stanford University in California, and have meetings at the United Nations in New York. Narendra Modi is the first Indian PM to visit the Silicon Valley in 33 years, according to the Indo American Community of West Coast, a non-profit promoting organization in the USA. As per his schedule during the visit to the United States, PM Modi will address an Indian American community of 20,000 members at SAP Centre in San Jose, California. It is also speculated that he may pay a visit to offices of Google and Facebook in the Silicon Valley. President Barack Obama will hold a bilateral meeting with him on September 28. 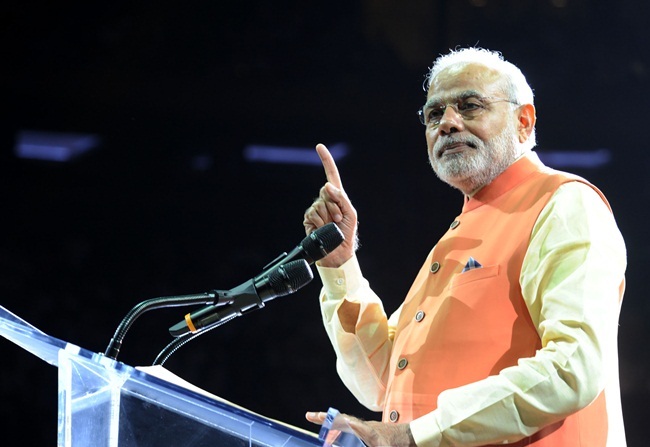 About 400 representations of 160 organizations have already met up to discuss how they will welcome PM Modi to San Francisco Bay Area, which is home to about five lakhs of Indian Americans. Venkatesan Ahsok, General Consul in India in San Francisco; Taranjit Singh Sandhu, Deputy Chief of Mission Ambassador, and Ram Madhav, National General Secretary of BJP were among the big heads in attendance in the meeting. They came up with a registration process to issue passes to those willing to attend the event in the Bay Area and meet PM Modi. During the meeting on August 9, Venkatesan Ashok issued mandate to the Indo American Community of West Coast for planning the event and uniting all organizations to make PM Modi’s arrival a grand success. All the representatives in attendance emphasized on the presence of diverse Indian American communities, irrespective of culture, religion, language and profession. Ram Madhav, National General Secretary of BJP, stated that the event to be organized in interest of PM Modi’s arrival would facilitate the unity, prosperity and security of both Indian Americans and Indians. PM Narendra Modi’s visit to California in September is highly expected to promote the ideals of entrepreneurship and innovation between India and Silicon Valley. A high possibility of empowering the economy of India through collaboration with Silicon Valley’s Indian American entrepreneurs and sharing of their technological expertise is anticipated, too. The Indo American Community of West Coast’s event in reception of PM Modi will connect the world’s biggest hub of technology-based entrepreneurship and India, the world’s largest consumer market. Those willing to attend the event or contribute as volunteers at SAP Centre in San Jose on September 25, visit the website pmmodiinca.org and register their names or organizations. Indian Eagle is a leading Texas-based travel partner of Indian Americans, booking their best flights to India from Austin and other major American cities at the lowest airfares from US-India airlines. I am a neurologist and professor of medicine at MSU and CMU. My ambitious goal is to bring my composition of BHARATMATA ASTHOTTARAM, EKAVIMSATI (21 name song) and GAYATRI MANTRAS on our motherland to our PM’s attention. Patriotism brings honesty and harmony and that is the goal of our PM’s visit. I would also like Venkatesan Ashok, Taranjit Singh Sandhu and Ram Madhav also to have a look at my compostion. My contact # 810-230-7770, 810-875-0793, 810-771-7438. They are on Youtube.com to watch. I will be glad to meet them in person to present the CD and DVD’s. Nice to see your comment! You can visit the website pmmodiinca.org and register your name for the event which the Indian American community is organizing in honor of PM Narendra Modi. Thanks a lot! Nice to see your comment! Please do find the website URL in the above-mentioned comment by us and contact the organizers.